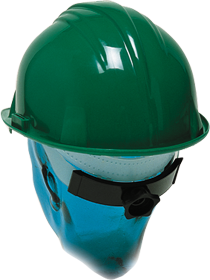 High density polyethylene shell, Rain trough to shed rain out over the peak rather than down the neck of the wearer, Reinforcing ribs for extra shell strength, 3 position vertical adjustable headband for a comfortable fit, Foam backed perforated vinyl sweatband, A combination head hugging nape strap and sizing adjustment, hats weighs less than 10 oz. 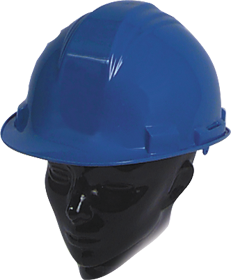 Side slots allow the easy attaching or detaching of accessories including: welding helmets, ear muffs, faceshields or combination of ear muffs and faceshields, or while screens maintaining standards and eliminating the need to drill the shell. Available in Blue, Green, Orange, Red, White and Yellow. 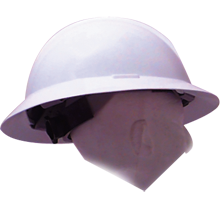 The ratchet nape strap is especially designed to fit the HH caps in order to secure the cap when used in strenuous activity, or when attachments such as welding helmets or faceshields are used. Easy to install, just snap into the side holes provided in the suspension. 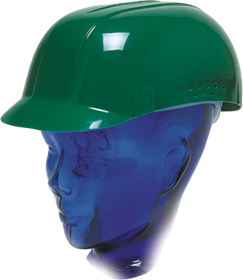 Low Hazard Area BUMP CAP Ideal protection against bumps, scalp lacerations and injuries resulting from contact with low overhead pipes, passageways and other objects. The bump cap is cool and light weight for total wearer comfort. Made out of polyethylene theses caps resist cracking and chipping. 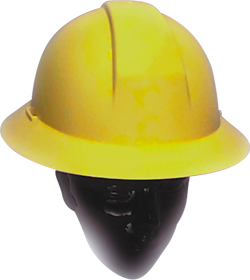 Bump caps are ideal for: Auto mechanics, Food handling and processing personnel, Meat packing employees, Plumbers, etc... Available in Blue, Green, Orange, Red, White and Yellow. Same as HHFB with 6 point web suspension with ratchet	.